Casino Group is a French multi-banner food retailer, with a controlling share in Grupo Pão de Açúcar (GPA) in Brazil. This report analyses GPA’s deforestation risk exposure based on beef samples collected through store visits. Chain Reaction Research (CRR) visited 50 GPA supermarkets in five Brazilian cities and inspected 500 randomly selected beef products. 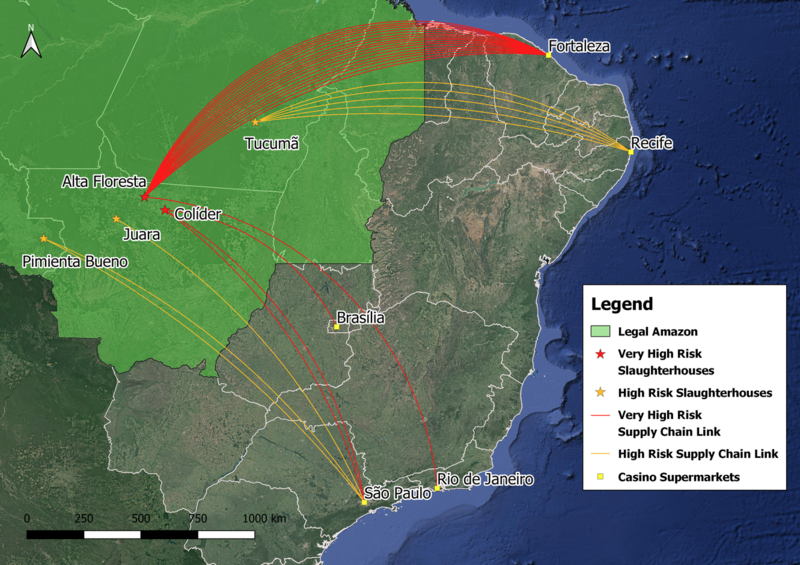 Data from the product labels establishes supply chain links between supermarkets and slaughterhouses located in the Legal Amazon. In 2017, GPA was the second largest retail company in Brazil with a 13.7 percent market share. GPA’s procurement and distribution centers have high stock capacities and allow for high volume purchases from distant sources. GPA may be exposed to deforestation and other sustainability risks within its beef supply chain. GPA’s Beef Purchase Policy does not state a specific timeline and has not been updated since March 2016, despite the company having announced a review by January 2018. The most recent progress report was published in July 2017. Thirty percent of the 500 sampled beef products originated from 23 slaughterhouses in the Legal Amazon. Of these 152 products, 30 originated from five high-risk slaughterhouses, all of which are owned by JBS and Marfrig Global Foods. GPA and Casino Group may both be exposed to reputational risks resulting from peer comparison studies. Twenty-five of the sampled beef products are linked to very high and high-risk JBS plants, compared to 16 for Cencosud and 7 for Carrefour. Reputational impacts may result in a GPA market capitalization loss of between 7 and 18 percent. This translates to a market capitalization loss of between 3 and 7 percent for Casino Group and between 18 and 46 percent for Rallye, Casino Group’s majority owner. Its bondholders and loan providers include HSBC, Santander, Deutsche Bank, UBS and BNP Paribas, which have deforestation-related cattle policies. Casino Group is a French multi-banner food retailer, with a majority of voting shares held by the French Rallye Group. Casino Group has more than 12,000 stores in France, Latin America, and the Indian Ocean region. In 1992, Casino merged with Rallye Group. In 1999, Casino invested in two retail companies in South America: Grupo Éxito, in Colombia, and the Companhia Brasileira de Distribuição, in Brazil, operating as Grupo Pão de Açúcar (GPA). In 2012, Casino took effective control of GPA’s operations in Brazil and combined all the Latin America operations under the Grupo Éxito. In 2018, Casino’s net revenues were USD 43.2 billion, and the Latin America segment accounted for 42.6 percent. (Source: Bloomberg). For the same year, 73.3 percent of Casino’s consolidated sales in Latin America came from GPA in Brazil, and 26.7 percent from Grupo Éxito in Colombia, Argentina and Uruguay. Despite Casino Group’s 41.4 percent stake in GPA, Casino has 99.9 percent control of GPA’s voting rights, as of March 11, 2019. The difference is due to the type of shares held. Via Varejo — home appliance stores. GPA’s store categories cash & carry, hypermarkets, supermarkets, and neighborhood markets represent 94.5 percent of Assaí and Multivarejo sales. Multivarejo and Assaí operate under six different banners: Assaí, Extra, Pão de Açúcar, Mini Extra, Mercado Extra, and Minuto Pão de Açúcar (see Figure 2). *Excluding non-food operations under Via Varejo subsidiary, with 1.034 stores of Ponto Frio and Casas Bahia banners. Source: GPA Institutional presentation Nov/2018. Number of stores per banner may vary according to different sources. Multivarejo and Assaí operate a total of 1,073 stores in 156 cities, located in 19 of the 27 Brazilian states (including the Federal District). Only 15 of these stores are in the Legal Amazon region: two are in Amazonas, three in Pará, two in Tocantins, and eight in Mato Grosso. The Southeast region concentrates 877 and the Northeast 124 Multivarejo and Assaí stores. These regions represent 69.1 percent and 18.3 percent of Multivarejo and Assaí sales respectively (see Figure 3). GPA’s procurement and distribution are organized through 23 distribution centers. These distribution centers represent 75 percent of the direct distribution of products to their stores. In December 2017, a fire event destroyed one of GPA’s Multivarejo distribution centers in Osasco responsible for the direct supply of 496 stores in São Paulo affecting 13 percent of meat and perishable products sales. These distribution centers indicate high stock capacity and the possibility of purchasing high volumes of products from distant sources. *Excluding non-food operations under Via Varejo subsidiary, with 1,034 stores of Ponto Frio and Casas Bahia banners. The number of stores. Source: GPA Institutional presentation Nov/2018. Number of stores per banner may vary according to different sources. GPA may be exposed to deforestation and other sustainability risks within its supply chain. GPA recognizes that it cannot guarantee the sustainability or legality of its suppliers’ activities. Its supply chain, therefore, carries deforestation and other sustainability risks. The company admits that its suppliers could face concerns over “working conditions or sustainability.” Moreover, if a significant number of its suppliers contend with these issues, GPA may incur reputational damage. Consequently, negative consumer perceptions could have direct impacts on net income and operation income, as well as share price value. Sustainability risks may materialize along the beef supply chain, as the product has a high risk of exposure to deforestation. Cattle ranching is a major driver of deforestation and beef products may be directly or indirectly sourced from farms that have seen recent deforestation. Beef production in Brazil is one of the leading causes of deforestation in the Brazilian Amazon. Together, land-use change and agriculture account for 73 percent of Brazi’s greenhouse gas (GHG) emissions. The Cerrado, a large tropical savanna biome that covers more than 20 percent of Brazil, has also seen high rates of deforestation since 2000. Being the second largest food retailer in Brazil, GPA is also one of the largest buyers of Brazilian beef products and may be exposed to significant deforestation risks in the Amazon and the Cerrado. Seventy-five companies that operate slaughterhouses in the Amazon have signed a “Termo de Ajustamento de Conduta” (TAC), a legally binding agreement with the Federal Public Ministry (MPF) to combat deforestation. When signing a TAC, companies are expected to not purchase cattle linked to slave labour or from areas deforested post-2009 in the Amazon. They also agree to avoid buying from areas that do not follow federal environmental regulations. TACs do not apply to the Cerrado biome. After audits in 2016, the MPF did not sanction irregularities at slaughterhouses, and civil society organizations started to realize that the TAC is a legal instrument with limited impact to combat deforestation in the Amazon. For these civil society organizations, it appears that the effect of the TAC is neutral since irregularities avoided by a TAC signatory might be “transferred” to a non-signatory company. After pressure from the MPF, the Brazilian Association of Supermarkets (ABRAS) signed a TAC in 2013 to improve sustainability in its supply chains. The TAC signed by ABRAS aims at guaranteeing that their associates’ supply chains are not linked to deforestation in Amazon. This TAC and civil society campaigns, such as the “Carne ao Molho Madeira” by Greenpeace, pressured food retail companies to establish their own sustainability policies for beef purchasing and to act more effectively in implementing them. One of these actions includes the implementation of monitoring systems for the traceability of direct beef suppliers. The traceability of direct suppliers may not address the full problem, however. Cattle typically move across various farms in their lifetime, including properties that may have seen deforestation. 100 percent transparency of the direct origin of fresh and frozen beef sold in stores. Supply only responsibly sourced beef within a defined timeframe. This is defined as meat that has not been sourced directly from deforested lands, farms using slavery or degrading working conditions, or farms involved in land ownership conflicts – whether due to encroachment on conservation areas or conflict with indigenous groups, Quilombolas, or other traditional communities. Develop tools for the slaughterhouse’s warehouses and processors within supply chains to ensure compliance. Accompany the implementation of transparency solutions of indirect suppliers. Communicate the achieved results publicly. GPA’s Beef Purchase Policy does not state a specific timeline for its commitments and has not been updated since March 2016, despite the company announcing that it would be reviewed in January 2018. The scope of the commitment is limited to “direct” suppliers. This means that its policy does not cover deforestation linked to farms that were not the last location before cattle was brought to a slaughterhouse. It also remains unclear how GPA would bolster efforts to increase indirect supply chain transparency. The most recent progress report of GPA’s Beef Purchase Policy implementation was published in July 2017. The company has not provided further information on progress since then. In 2017, GPA reported sourcing fresh or frozen meat from the three big slaughterhouses (JBS, Margfrig, and Minerva), in addition to 43 small and medium suppliers. Between 2016 and 2017, GPA banned seven beef suppliers that did not agree with its beef purchasing policy. Twelve of GPA’s direct suppliers located in Amazon had implemented the Safe Trace traceability system. The Safe Trace is a GIS system through which slaughterhouses can map their direct suppliers and further monitor if they are linked to deforestation, irregular land occupation, and slave labor. In the first half of 2017, 50.8 percent (3.785) of farms supplying these slaughterhouses were traceable through the Safe Trace system, and 48.2 percent (1.825) of these farms were located in Amazon. Among these farms, 97 (5.3 percent) were embargoed and four were involved with slave labor. Casino and GPA are both signatories of the Statement of Support for the Cerrado Manifesto. This manifesto, launched in 2017 by civil society organizations, called on companies to commit to zero deforestation in the Cerrado biome. The GPA’s Beef Purchase Policy does not include actions to halt deforestation in the Cerrado biome. To assess whether GPA is adequately mitigating its exposure to deforestation risk in the Amazon, CRR sampled 500 beef products from GPA’s stores. Each of the collected sample contain the name, location, tax identification number of the slaughterhouse and date of processing (see Figure 4). CRR randomly collected these samples during visits to 50 Cash & Carry (Assaí), Hypermarkets (Extra), Supermarkets (Extra and Pão de Açúcar), and Neighbourhood (Minuto Pão de Açúcar) stores located in five cities: São Paulo, Rio de Janeiro, Fortaleza, Recife, and Brasília. These five cities include most of these brands’ stores. The regions where the visited stores are located (Southeast, Northeast, and Mid-West) represent 96.1 percent of GPA’s Multivarejo sales (see Figure 3 above). Whether the suppliers have high risk of deforestation within their cattle supply shed. The assessment of suppliers’ deforestation risks was based on a 2017 study from Imazon. This study ranked beef supplier companies’ exposure to deforestation (very high, high, medium, low, very low) based on the areas of their supply sheds that consist of embargoed areas, recent deforestation, and risk of future deforestation. Thirty percent (152 products) of the 500 sampled beef products originated from slaughterhouses in the Legal Amazon. 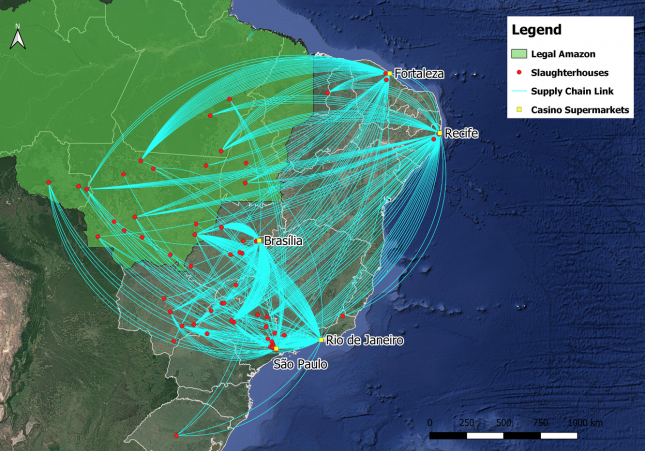 GPA’s stores in Fortaleza (50), Rio de Janeiro (44), Recife (32), and Sao Paulo (22) had significant exposure to these Amazon slaughterhouses, whereas its stores in Brasilia (3) did not. Information about the origin was not available on 6.6 percent of the sample (33 products) (see Figure 5). GPA’s samples originated from 69 different slaughterhouses, of which 23 are in the Legal Amazon. These slaughterhouses are owned by seven meatpacker companies and correspond to 18 percent of all Amazon slaughterhouses active in 2016. Of the 152 products sourced from within the Legal Amazon, 130 came from JBS and eight from Marfrig Global Foods S/A. Of the 152 products from the Legal Amazon, 30 originated from five very-high or high risk slaughterhouses. These products are sourced by two meatpacking companies: JBS (25 products) and Marfrig Global Foods (five products). All their very-high and high-risks slaughterhouses are TAC signatories. * CRR ranked the slaughterhouse of Marfrig Global Foods in Tucumã (Pará) as a high risk one according to the rank of a JBS slaughterhouse in the same municipality. MT: Mato Grosso, RO: Rondônia, and PA: Pará. Source: CRR / Repórter Brazil and Imazon. Figure 8 below depicts the locations and supply chain links of these high-risk slaughterhouses to GPA. Casino may be exposed to reputational business risks. Twenty-five of the GPA sampled beef products are linked to very high and high-risk JBS plants, compared to 16 for its peer Cencosud and seven for Carrefour. Among the 25 GPA sampled products, 22 are linked to the very-high risk JBS plants in Alta Floresta and Colider, Mato Grosso, compared to seven from Cencosud samples and none from Carrefour samples (see Figure 10). These numbers may expose GPA to reputational risks resulting from peer comparison studies. *Alta Floresta and Colider are very high-risk plants. During the last four years (2015-18), GPA experienced growth in its revenues and gross profit (Figure 10). In FY2018, GPA realized 11 percent higher net revenues in Brazilian Real than the year before (Source: Bloomberg). In FY2018, GPA increased its same store sales by 5.5 percent (in Brazilian Real) and its number of total stores by 10.7 percent. This rise is due to the increases that both Multivarejo (supermarkets) and Assaí (cash and carry operations) experienced in same store sales and in the number of their total stores. For Multivarejo, same store sales increased by 3.5 percent and its number of total stores by 1.1 percent. For Assaí, same store sales increased by 8.3 percent and its number of total stores by 24.1 percent. GPA’s EBITDA developed weakly the last four years (2015-18) (Figure 10). For FY2018, GPA’s EBITDA increased by two percent. Although the Assaí segment of GPA increased its EBITDA by 58 percent since FY2017, Multivarejo’s EBITDA declined by 21 percent (Source: Bloomberg). As discussed above, Casino’s presence in Latin America and more specifically in Brazil is of high importance. 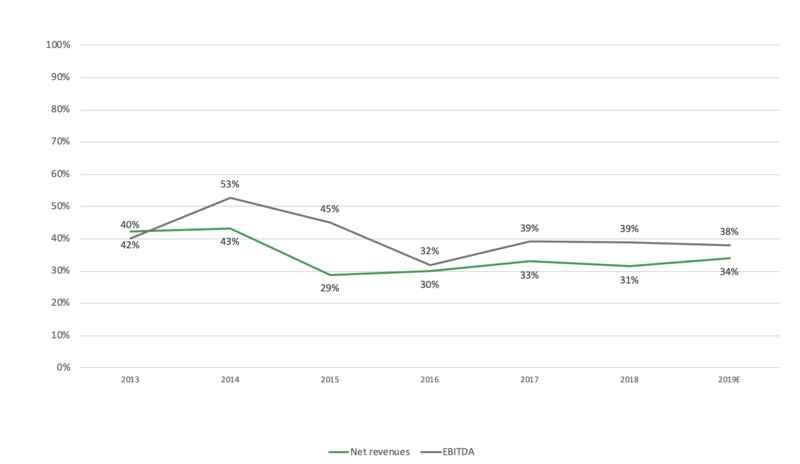 In FY2018, GPA’s net revenues and EBITDA were 31 and 39 percent of Casino’s net revenues and EBITDA respectively (Figure 11). A majority of Casino’s shares (52 percent) are held by Rallye Groupe. Rallye, besides holding shares in Casino, is involved in non-food sporting goods retail through Groupe GoSport (two percent of Rallye’s net revenues). A majority of Rallye’s shares are held by Groupe Euris (54 percent), which is a private French entity. Jean-Charles Naouri, who is the chairman and CEO of Casino as well as the Chairman of the Board of Directors of Ralley, created Groupe Euris. For 2018, Casino’s net revenues accounted for 98 percent of Rallye’s net revenues, and therefore GPA’s net revenues were 30 percent of Rallye’s net revenues. This percentage is not representative of the profit contribution of GPA to Casino and Rallye, as Casino fully consolidates GPA’s revenues, although its stake at the company is 41.4 percent. 0.9 to 2.3 percent of Casino Group’s current Enterprise Value and 2.7 to 6.8 of its market capitalization. 0.5 to 1.2 percent of Rallye’s current Enterprise Value and 18.3 to 45.8 percent of its market capitalization. 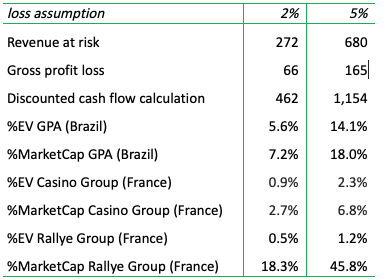 The Enterprise Value and Market Capitalization of Casino and Rallye Group were adjusted based on the ownership percentage Casino to GPA (41 percent) and the ownership percentage of Rallye to Casino (52 percent). The impact on Rallye’s MarketCap could range between 18.3 and 45.8 percent, which is much larger than the effect on Casino’s MarketCap (between 2.7 and 6.8 percent). The impact on both Rallye’s and Casino’s Enterprise Value is in the same range. This is due Rallye’s MarketCap standing at USD 0.5 billion, while Casino’s is circa USD 7 billion. Both companies’ Enterprise Value are similar. A majority of institutional investors in GPA, Casino, and Rallye lack deforestation-related policies regarding cattle and soy. 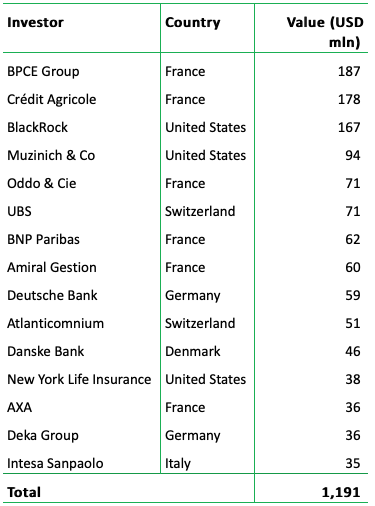 More specifically, Carmignac Gestion (France) is the only institutional shareholder of GPA holding above five percent. The US-based Brandes Investment Partners, BlackRock, and Vanguard hold three, four, and two percent respectively (Source: Thompson Reuters Eikon). None of GPA’s institutional investors have a specific deforestation-related policy regarding soy and cattle. The top three institutional shareholders of Casino are BlackRock (United States), Goldman Sachs (United States), and Aviva (United Kingdom). BlackRock and Goldman Sachs hold five and three percent, while Aviva holds two percent (Source: Thompson Reuters Eikon). None of these investors have a specific deforestation policy regarding soy and cattle. However, Aviva is a signatory of the Statement of Support for the Cerrado Manifesto and is engaging with cattle investee companies on deforestation risks within their supply chains. BlackRock acknowledges deforestation as a climate risk but still lacks a concrete policy. Rallye’s institutional shareholders that hold above one percent are the U.S.-based Dimensional Fund Advisors (two percent), Vanguard (one percent), BlackRock (one percent), and Bank of New York Mellon (one percent). None of these investors have a specific deforestation policy for soy and cattle. Investors in Casino face ongoing concerns due to Rallye’s high debt situation (net debt/EBITDA for 2018 reached 4.14x). As Reuters reported in October 2018, “Within the Casino group, dividends from Casino are used to maintain Rallye’s debt interest payments. The shares of Casino that are held by Rallye are also pledged as collateral to banks in order for Rallye to obtain more financing.” Currently, Casino has a plan in place to dispose EUR 2.5 billion of non-strategic assets by the first quarter of 2020. Nonetheless, on April 2, 2019, Moody’s downgraded Casino’s credit rating by two notches to Ba3. For this downgrade, the low free cash flows the company generated, as well as the high leveraged position of its parent Rallye, played a role. As a result, Casino might find it more difficult in the future to attract financing or see its interest rates increase. In the two customer loss scenarios discussed (loss of two and five percent), GPA could lose between USD 18 to 44 million of its EBITDA due to market loss risks, calculated with the average EBITDA margin of GPA the last five years (6.53 percent). The net debt/EBITDA ratio could then potentially rise to 0.37x at the five percent loss assumption scenario. This impact is small, as GPA’s net debt for 2018 was relatively low. However, the consequences could be more severe for Rallye, which had a 4.14x net debt to EBITDA ratio for 2018. Rallye could lose between USD 14 and 35 million of its EBITDA, calculated with the average EBITDA margin of the last five years (5.24 percent). Net debt/EBITDA ratio for Rallye could potentially rise to 4.22x at the five percent loss assumption scenario. This loss could further weaken the company’s already weak financial position and by extension its subsidiaries. At the end of FY2018, GPA had an outstanding amount of USD 10 million in loans provided by the Brazilian Development Bank (BNDES). BNDES has cattle-specific environmental guidelines in place: “Applicants for financial support should declare that the system to purchase cattle meets the BNDES’ requirements.” These requirements include that direct suppliers should not have criminal offences related to deforestation or land grabbing, or be involved to land disputes. Since 2013, several banks have provided loans to Casino. Among them, Deutsche Bank have provided USD 233 million since 2013 (Sources: Thomson Reuters Eikon and Bloomberg). Deutsche Bank has a beef and soy specific policy in place (see above paragraph about Casino). HSBC also provided loans to Casino of USD 188 million since 2013 (Sources: Thomson Reuters Eikon and Bloomberg). HSBC has a specific beef policy (see section above about GPA). At the end of FY2018, Rallye’s outstanding in bonds totaled USD 9 billion and in loans USD 5.1 billion. From this, the total value that could be identified in the hands of specific bondholders is USD 171 million, with only three them with USD 10 million and above. These include the French-based BPCE Group (USD 88 million), Hugau Gestion (USD 15 million), and Groupama (USD 10 million) (Source: Thomson Reuters Eikon). None of these financial institutions have a deforestation specific policy regarding cattle and soy. Since 2013, several banks have provided loans to the company. Among them, HSBC and BNP Paribas with USD 121 million each (Sources: Thomson Reuters Eikon and Bloomberg). Both those financial institutions have beef-specific policies (see sections above about GPA and Casino). In conclusion, GPA could lose between 7 and 18 percent of its market capitalization if it becomes the target of civil society and consumer campaigns related to sourcing beef from deforested Amazon areas. This translates to an impact of between 3 to 7 percent to Casino’s and between 18 and 46 percent to Rallye’s market capitalizations. Amongst the bondholders and loan providers of GPA, Casino and Rallye are HSBC, Santander, Deutsche Bank, UBS, and BNP Paribas. 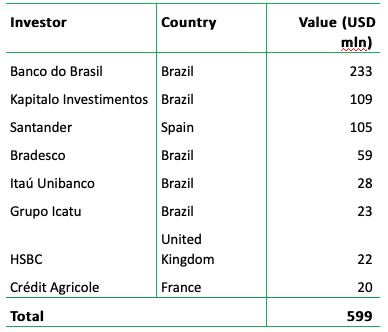 These financial institutions have specific deforestation related cattle policies in place, so there is financing risk. Financing risk is higher for Rallye, as the company is already highly leveraged, with net debt/EBITDA for FY2018 standing at 4.14x.